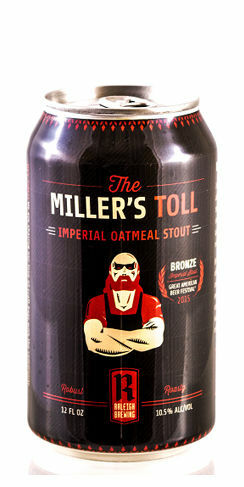 The Miller’s Toll is one of the best stouts we’ve ever reviewed. The ABV of this effort is high, but the density of flavors that exist here in this imperial oatmeal stout means that any sort of alcohol sharpness is hidden masterfully. The beer pours with a dark brown to nearly blackish color with a fair amount of dark-brown/tannish head that gradually dissipates. Nutty and coffee-heavy notes are immediately present, with bits of roasted malt and oak coming through in subsequent sips. At points, dark fruits including figs and prunes bubble up, making for a wholly different experience with each pull from the brew. Other elements round out the overall flavor profile, including molasses and bits of vanilla. Each can of The Miller’s Toll is able to keep its overall flavor profile nicely, with the bold tastes that initially present themselves staying in focus until the final few sips of the beer. The Miller’s Toll would be paired well with strongly-flavored meats and cuisines, providing a bold counterpoint to anything with a robust taste. Two or three cans of this imperial oatmeal stout would suffice over the course of the night; there are enough twists and turns present here that individuals will be as interested in the final pulls from the last can as they were when they opened up the initial offering. For more information about the entire line-up of Raleigh Brewing efforts, visit their main domain. Further events and information can be located at their social media profiles. Keep an eye out for the next canning of the Bourbon Barrel-Aged variant of The Miller’s Toll, which last hit stores in the waning days of 2015. If The Miller’s Toll is indicative of Raleigh Brewing’s overall quality, one should actively search out any of their brews.